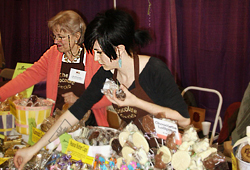 Zendaya Coleman, star of the show “Shake it Up!” signs autographs for fans! 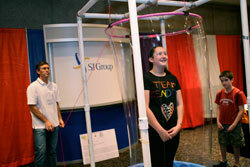 The SI Group presents the beloved Bubble Machine at the area’s largest STEM event, celebrating Science, Technology, Engineering and Math! 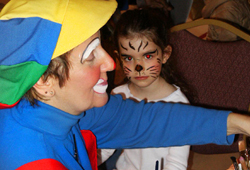 Crowds flock to the stage to get photos of “Rocky” from Disney’s top-rated show. 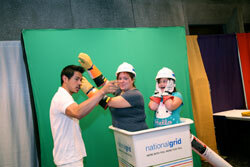 Take a ride on National Grid’s lift, an exciting learning experience at the Back to School Expo. 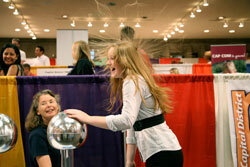 Static hair is flying high at the miSci booth, where science is fun. 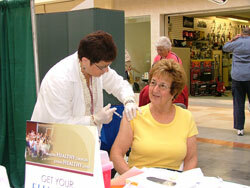 Flu shots are always a major attraction of Senior Expo, an event to benefit Senior Services of Albany. Fifty exhibitors provided information on products and services available to seniors and caregivers throughout the region. 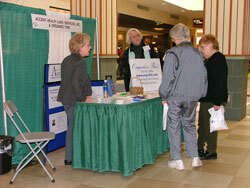 Thousands of Seniors converged upon Colonie Center Mall to visit exhibitors and experience the free health screenings. 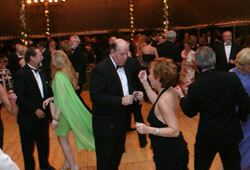 The New York Players makes any gala a success! 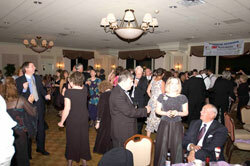 NABA Table and dancing – The crowd was on their feet at the Tulip Ball, a benefit for the Northeastern Association for the Blind at Albany. 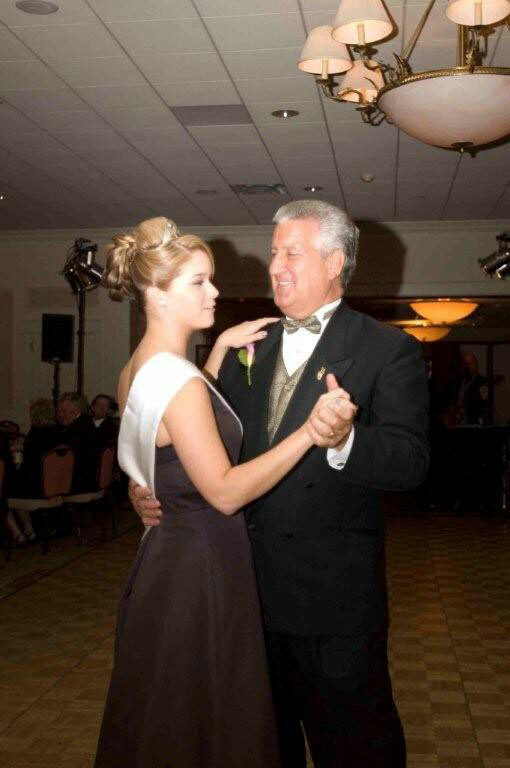 It’s a time honored traditional for Mayor Gerald D. Jennings to dance the first dance with the newly crowned Tulip Queen. 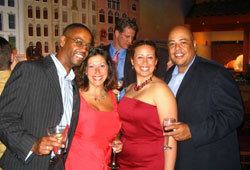 Committee member Andrea Golub enjoys many laughs at the Latin-themed event. 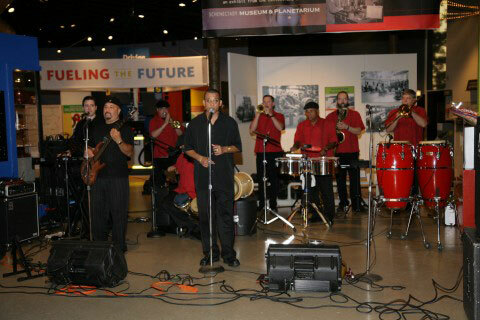 Alex Torres and his Latin band provided the perfect ambiance for this fun-filled night. Guests of the Schenectady Museum and Suits Bueche Gala relax on the patio. 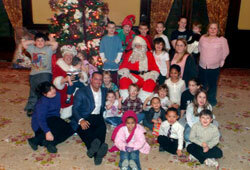 More than 80 children from low-income families received gifts from the David B. Silipigno Foundation at this year’s Holiday Gift Give-A-Way party! 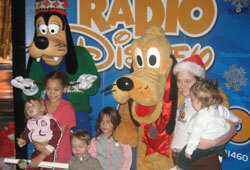 Children from Saratoga Mentoring and Big Brothers Big Sisters programs got a chance to meet Disney characters who flew in all the way from Walt Disney World Resort! 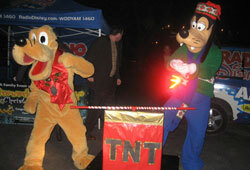 Pluto and Goofy kick off the community FIREWORKS event in Congress Park, Saratoga Springs. 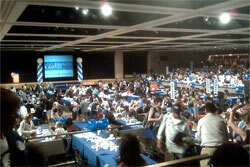 A lovely luncheon at the Wolferts Roost was the scene of this year’s WAMS (Women Against Multiple Sclerosis) event in Albany, NY. 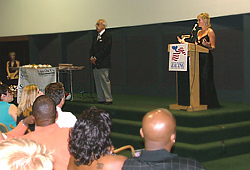 Benita Zahn of WNYT NewsChannel 13 was presented with an award honoring her commitment to the mission of the National MS Society. 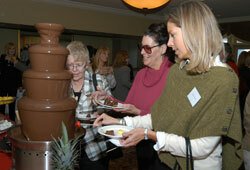 Nearly 300 guests enjoyed a chocolate fountain donated by We Do Fondue, and champagne donated by All Star Wine & Spirits! 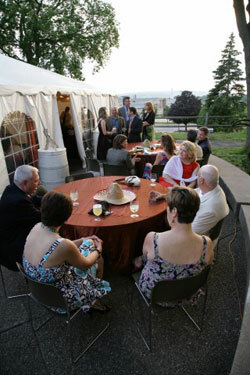 Guests of the gala enjoy a tented event that overlooks Washington Park in Albany, NY. 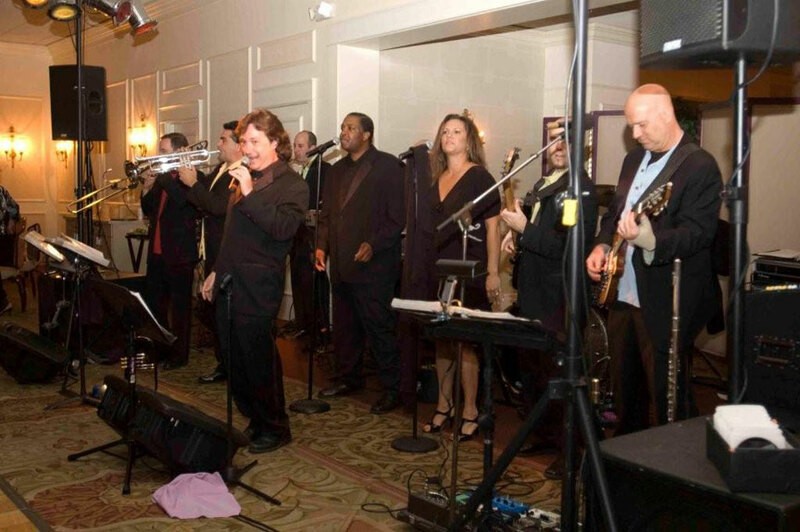 The New York Players kept the crowd on their feet all night long. More than 400 guests came out to support the Albany Institute’s mission of collecting, preserving, interpreting and promoting interest in the history, art and culture of Albany and the Upper Hudson Valley. 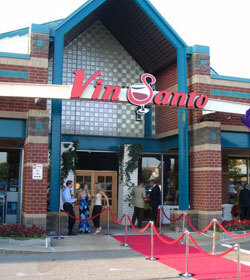 It was a red carpet entrance at the Grand Opening of Vin Santo Wine Bar in Latham, NY. 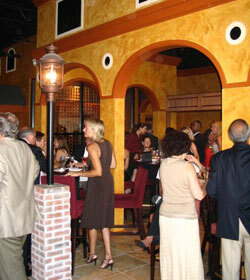 The inside of Vin Santo Wine Bar is decorated in a Tuscan theme with hand painted wall murals and stunning tile. 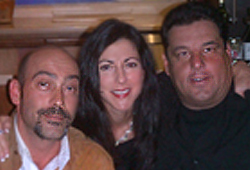 Guests enjoyed a sampling of the restaurant’s upscale wine list, as well as the area’s best raw bar. 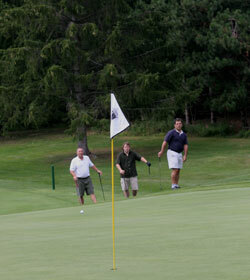 Charity golf tournaments are a great way to raise money for area not-for-profits! 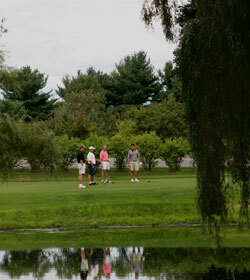 Here, golfers enjoy the beautiful view at Albany Country Club. 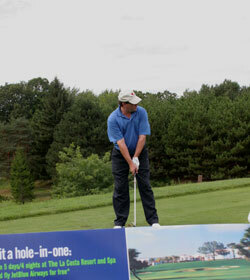 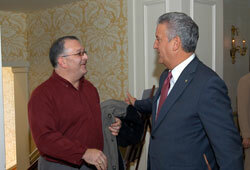 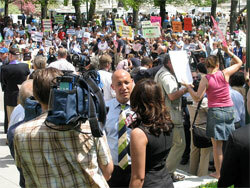 Some participants take part in the Jet Blue Challenge, winning a variety of exciting prizes. 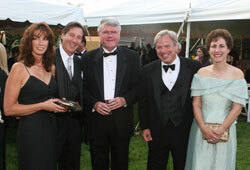 Guests enjoy more than 200 fine wines from around the globe! 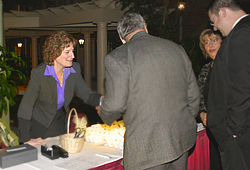 Guests bid on exciting silent auction packages, helping raise more than $100,000 for Senior Services of Albany's Meals on Wheels program. 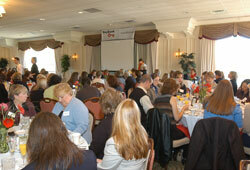 Kristina Krawchuk of Capital News 9 emcees a live auction that included a trip to wine country, Napa Valley! 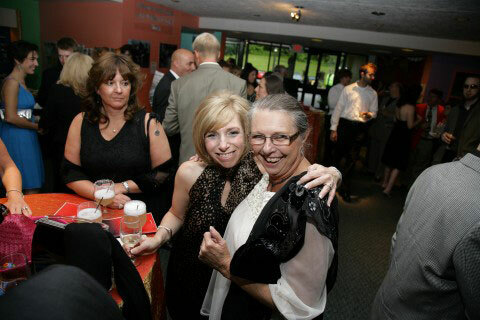 It was a setting that made the 3rd Age award winners feel as special as they truly are at the annual ceremony honoring the Capital Region's most inspirational seniors. 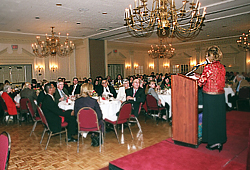 Washington Post columnist and speaker, Abigail Trafford, was the guest speaker at the Desmond event, drawing nearly 300 guests. 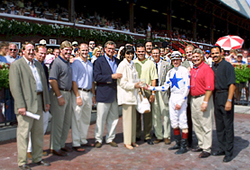 It was an exciting event at Saratoga Race Track with thundering horses and celebrities abound! 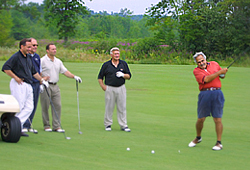 Former NHL hockey stars, including Bobby Hull, came to Saratoga National to raise money for a great cause! 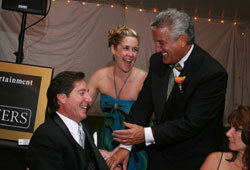 The Circle of Life Camp hosted hundreds of guests at their annual fundraiser with celebrities from HBO's hit series SOPRANOS. 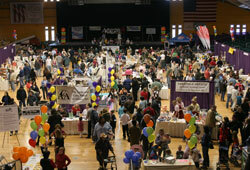 Even the kids enjoyed the festival, with face painting and Oreo Cookie Stacking!